The winter programme began with a tour of the NC Engineering factory which is located in Hamiltonsbawn in the heart of the Armagh NW Group area. NC Engineering was founded in 1975 by brothers Norman and Alexander Nichol and Wilfred Carson, who identified a gap in the market for an efficient slurry pump. Following the successful launch of this product the company has expanded and developed many new and innovative products, which includes a range of site dumpers, agricultural machinery, construction equipment, commercial and forestry trailers as well as telehandlers. Lunch was held at Darby’s Bridge Coffee Bar and Bistro located on the Annareagh Road between Hamiltonsbawn and Richhill, which is owned by Dean Irwin and managed by his son, Stephen. In the afternoon members made their way to the Air Ambulance NI HQ at the Maze where a cheque for £5,027.20 was presented to chief fundraiser Kerry Anderson. This money was raised through a fundraising activity “Can’t Cook:Won’t Cook” which the group organised and was hosted by the group chairperson Joy Rollston. 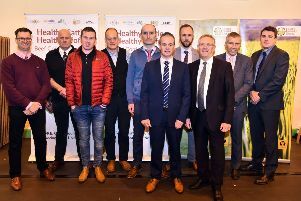 Past UFU president Barclay Bell, together with group members Philip Toner, William Irwin and George McCall, kindly volunteered to be the contestants for the event which was well supported by the local community. Joy has just recently launched a new business venture called Auntie Joy’s Kitchen which is a mobile van situated on Killylea’s main street, suppling delicious fast food, breakfasts and soups on Thursday evenings and all day Friday and Saturday. You can follow her on Facebook “Auntie Joy’s Kitchen” to find out about the menu and specials of the day. Looking forward to the new year, a table quiz will be held in the City of Armagh Rugby Club. Auntie Joy’s Kitchen will be providing the supper of chicken and chips. Further details will be announced in January. The Co Armagh UFU dinner dance is being held on Friday, January 18th in the Canal Court Hotel. Kenneth Hill, county chairman, would encourage as many as possible to attend this evening.